A new report released by Berg Insights shows why so many want to get into the app-writing business. Of course, everyone wants to be the next Rovio with its Angry Birds franchise, but successes like that are certainly rare. Nonetheless, the report shows that the number of apps downloaded on a mobile device will grow at a compounded rate of 56.6% between 2010 through 2015. 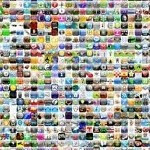 By that last year, 98 million apps will be downloaded over those 12 months. Berg says that despite the large number of downloaded apps, turning those figures into moola will be the hard part for developers. Berg Insights senior analyst Johan Svanberg said that despite the strong numbers showing increasing downloads of apps, turning downloads into money will be a challenge for developers. Free-to-download-apps will lean heavily on in-app purchases and in-app advertising. Revenue from apps will grow at a compounded rate of 40.7% reaching 8.8 billion euros ($11.78 billion USD) in 2015, up from 1.6 billion euros in 2010. Apple's iOS is the leading platform in monetizing apps and will remain on top through 2015, according to Berg. By that year, Android and Windows Phone will be second and third respectively. Svanberg says that the Asian-Pacific region will account for 40% of all app downloads by 2015. The report adds that while new technology such as HTML5 will eventually fuel challenges to native apps, those developers looking to maximize their reach should write not just for the major mobile platforms, but also for the web as well.